The SOS (Save Our Snoopies) Beagle Rescue is a non-profit organization dedicated to saving the lives of beagles by sheltering homeless or abandoned dogs and adopting them to loving homes. 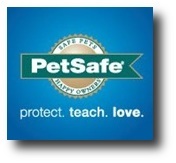 Our chapters are located in New Jersey, Tennessee and Alabama. We do not, however, have an actual shelter or public facility for you to visit. All of our beagles are in foster care or with their owners. All of our beagles are spayed/neutered, microchipped, up to date on vaccinations, and on heartworm preventative, prior to adoption. If you are not in our areas near Birmingham, AL, Northeast Tennessee and New Jersey, please consult our Rescue Locator Map for other beagle rescues in the U.S. 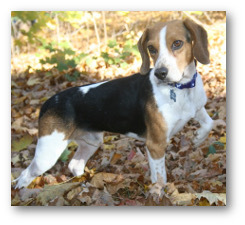 If you see a beagle that you are interested in, please read over our adoption guidelines and submit an application form. Please keep in mind that you must be willing to travel to meet both us and the dog!! 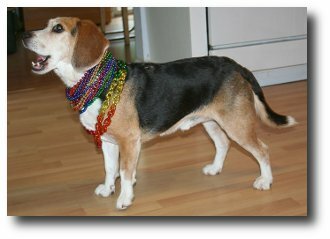 Add some color to your life--adopt a beagle! A special thank you to Jennifer Capriglione and Marco Ciaglia who made a generous donation in lieu of wedding favors for their upcoming wedding. 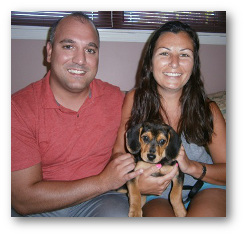 We wish them, along with SOS alumna Winnie, the best in life!